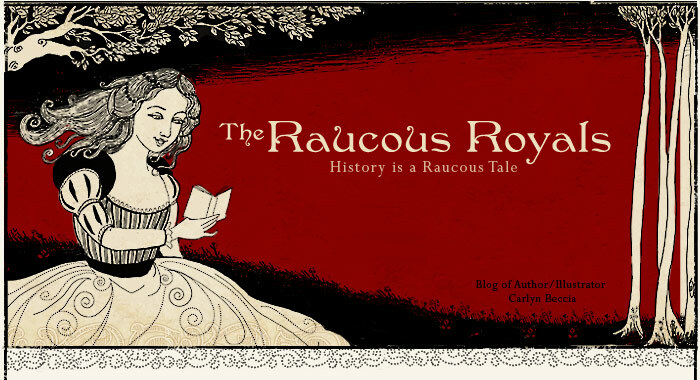 The Raucous Royals: Quiz time: Can you guess the most deadly invader in London’s history? Quiz time: Can you guess the most deadly invader in London’s history? The proud city of London has been brought to its knees by many invaders, but one particular assailant packed the Muhammed Ali of punches to local residents. This mystery invader could rip flesh from bones with its bare teeth at a force of 7000 pounds per square inch. They could scale the tallest fortification and fall fifty feet without any harm. They felt no remorse invading the homes of helpless women and children and they laughed in the face of danger (1) This invader may sound fictitious, but it was very real. And much like Muhammed Ali’s famous "rope-a-dope" strategy, just when Londoners thought they had it beaten…. it came back year after year and multiplied in strength and numbers. What was this insidious raider upon the peaceful streets of London? Ok I made that up but the rest is 100% factual. Answer: RATS. Or more precisely, Rattus rattus otherwise known as the black rat. The true problem was food, not filth. 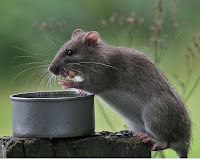 London's sanitation methods gave the rat had an all-night buffet of every food choice imaginable. Slaughter houses killed animals on the streets and left their decaying bodies to rot amongst the stench. Barber surgeons bled their patients and then dumped the blood into the narrow street. Wild pigs and dogs roamed freely and fell dead in ditches. “Rakers”, the trash collectors of their day, were employed to cart the rubbish away, but they tended to fall into the drunk and lazy category and often simply deposited waste in neighboring wards or hoped the rain would wash it into the Thames (rats btw, are excellent swimmers and have even been known to survive the good old toilet flush). Fines were instituted and often ignored. London’s population had become so large that it was simply too difficult to keep the rat's food supply down. These were good times to be a rat. Londoners fought back with futile measures using poisons such as hellebore root. Unfortunately, rats are extremely smart creatures and will actually learn over time what is poisonous and then warn their rat buddies not to eat the poison by urinating on it. (rats don't eat feces or urine...even they have standards.) 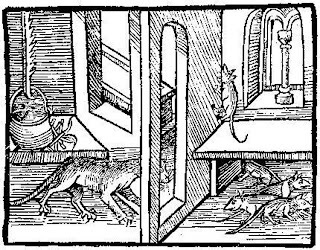 Other rat removal methods only aggravated the problem, such as a popular 17th century remedy that advised housewives to, "Fry a sponge in butter and hang it by a string, and the rats will forsake the room. "(2) I don't know about you, but I have never seen a rat forsake butter. When poisons and butter didn’t work, Londoners employed “rat catchers” (shown above right) to round up rats Holocaust style. But rats are also amazing breeders. Left to their own vices, two black rats breeding for three years can produce 329 million offspring. That’s a lot of baby rats biting the toes of London’s children. But sadly, the rat’s true handmaiden of death was not in its bite, but on its back. A bad day for ratsWhat could possibly be worse than a fat, healthy rat crossing your path in 14th century London? A sick plague infested rat crossing your path in 14th century London. For hidden in its fur, Mr. Rat carried one of the deadliest forms of germ warfare known to man—Bubonic Plague. The Victorians christened it “The Black Death” and for good reason. This disease was truly dark. It killed four out of five people it infected and usually in less than four days. Symptoms began with fever, chills and headaches. That was the fun part. On the last days of the disease, puss filled sores called buboes erupted like walnut sized zits. In the 14th century, the plague annihilated at least 1/3 of London’s population (about 200 people per day) and some historians estimate closer to 1/2 of the population in other areas. The death toll became so great that church bells stopped ringing to honor the dead. Husbands abandoned wives. Wives abandoned husbands. Children were orphaned over night. And then there was the little problem with how to bury so many corpses. Grave diggers got lazy and stacked bodies on top of each other in shallow graves only for the dogs to dig up the corpses the next day. Imagine seeing grandma's body dragged through the silent streets by a hungry dog. And do you think the rats cared? Well, plague was not any picnic for them either. Here is how plague worked: the rat fleas fed on the rat’s blood and became infected with Y. Pestis. This infection resulted in a blockage of undigested blood in the flea’s foregut causing the flea to vomit the plague bacilli into its victim with each bite. 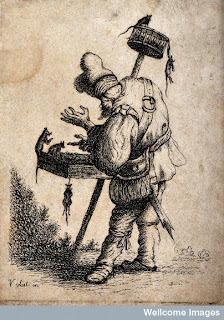 As a bonus side effect, nutrients were prevented from ever reaching the flea and without any nutrients…14th century Londoners had some very hungry rat fleas on their hands. Have you have ever met a hungry rat flea? Let’s hope you never do. When starving, they are not particularly picky eaters. After their rat host dies, cats, dogs, bunnies, and cute little medieval boys and girls taste just as yummy. Debate still continues on the true cause of the Black Death, but it is still generally believed that infected rat fleas jumped from rats to humans and then….BAM you were trapped in a Grien painting. (ouch....my hair!) 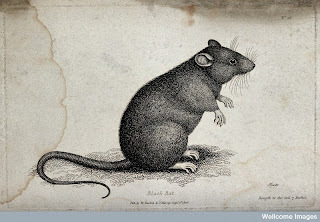 However, several questions have caused debate about the rat's role in the 14th century plague. First, there were no reports of medieval rats dieing. Rat fleas typically bite humans when the rat population is decreased so dead rats piling up was a clear sign that rat fleas would be looking for their next meal. Some have speculated that the death of rats went unnoticed because dead rats were such a frequent occurrence in London. Second, the Black Death never subsided in winter months when rat fleas obviously would not be as active. In fact, some of the highest death rates were in December and January. Third, the disease spread so quickly and rats are not exactly the adventurous type. As long as they have food, they tend to stay in the same 100 feet radius their whole lives (approximately nine months). Some scientists have speculated that the human flea would have done a far better job spreading plague than the rat flea because humans traveled greater distances and would have had more opportunity to spread plague from person to person. Others claim that the human flea contains too few bacilli to spread the disease efficiently. These questions have led to some rat defending conspiracy theorists. The rat defenders have speculated that the plague was really a deadly form of cattle Anthrax or the Ebola virus. To complicate matters further, plague could be transmitted person to person through the air, called pneumonic plague and this more virulent form of the plague did not require any rats. So once the plague got going, the rats were not entirely to blame. There was a benefit that the black rat left in its wake. Plague deaths caused Europe to have a labor shortage and the surviving peasants could now demand higher wages for menial labor. This eventually led to the collapse of serfdom and freed up capital. In other words, with everyone dead and buried, the people left standing got a pay raise. 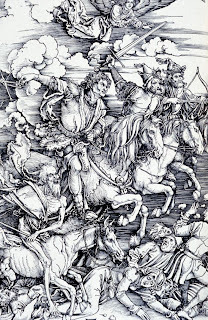 Some even argue that the Renaissance wouldn't have happened without all this fire and brimstone urging progress and democracy forward. From a biological standpoint, those who survived may have also developed immunity to the plague and this immunity is identical to HIV immunity. So if you have an ancestor that survived the plague, you could be immune to HIV. Now, go thank a rat. Today the black rat is far less common than its much larger cousin, the brown rat. (The brown rat is the city rat you see today scampering around the corner after you have just finished a big, expensive dinner in a fancy restaurant.) Rats still cause all sorts of raucous, mostly from their gluttonous diets. They eat crops destroying valuable grain. They eat through clothing. They have killed off over 19 species of birds in their quests for eggs. (Rats really like eggs.) Heck, they will even eat right through a lead pipe. But probably the most annoying thing they eat is history. Most of British History's most important documents are illegible because they are half-eaten by rats. Some think rats are sort of cute and keep them as pets. Today we have "fancy" rats and whole organizations dedicated to loving rats. Rat pet owners say their rats are very similar to dogs - easily trained, curious, lovable and extremely sociable. 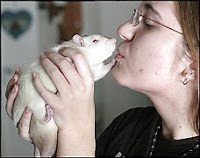 (If you get a pet rat than you have to get him a girlfriend/boyfriend. Rats hate to be alone.) Rats are sort of cute...from a very safe distance. The plague continued to wreak havoc throughout the 14th century and made a spectacular appearance in the The Great Plague of 1665 and again in 1890, but none of these plagues matched the destruction of the Black Death. Y. Pestis is still a very real problem today. About 3000 cases of Bubonic Plague are reported worldwide. In America, the disease can be spread by rats, skunks, prairie dogs, squirrels, chipmunks and even cats. Fortunately, the plague can now be cured by antibiotics, if it is caught it time. Currently, there is no vaccine for the plague. 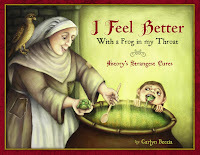 Stay tuned for a future post on the wackiest plague cures in history to coincide with the release of my next book: I Feel Better with a Frog in my Throat, History's Strangest Cures (October 2010). Notes:(1) Yes, rats really do laugh. If you tickle their tummy they will make a sort of chirping sound. If you don’t believe me then this scientist who studies rat laughter will. (4) Besides X. cheopis, Y. Pestis can be transmitted by over 31 different flea species, possibly including P. irritans (the human flea). Marrin, Albert. Oh Rats! The story of rats and people, New York: NY, Dutton, 2006. Kelly, John. The Great Mortality. An Intimate History of the Black Death, The Most Devastating Plague of all time. New York: NY, Harper Perennial, 2005. Mortimer, Ian. The Time Traveler's Guide to Medieval England. A Handbook for Visitors to the Fourteenth Century, New York: NY, Touchstone Books, 2008. I am a proud owner of fancy rats. Our first one was a hairless rat - my husband hated that people were making fun of it at the pet store and decided to get her. She was so ugly she was cute! At first I was creeped out, but I feel in love with her overnight and we got a second one the next day - this one with hair, so she would help keep the naked one warm. We only have one at the moment, but have owned 6 in the past few years. They are awesome pets - smart, trainable and sweet - ours likes to sleep on your shoulders and snuggle. But I can understand people's aversion to them. I hear that the tail is what really creeps people out. Sadly, their life expectancy is short, about 2-3 years, so you have to make the best of it with them! And I cry like a baby every time one of them passes on. Very interesting post, as always! PS - I am SO home and see if I can make my rat laugh! 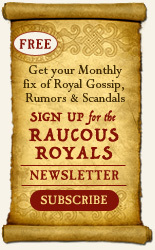 Rattus Rattus, really? Now that's a scientific name! Some thing will never go away I guess, I know the lovely ladies from How Clean is Your House had a an episode dedicated to rats in London. Amy - I had a friend in college who had a pet rat. At first I was totally creeped out by it but then the little critter grew on me. They are super smart too. 2-3 years is very short but that is at least better than the black rat - about 9 months. Now that is a short life. University students here in the United States will hold performance contests for their rats. These are called the "Rat Olympics", and involve feats like climbing ropes and putting a ball through a hoop "rat basketball". The rest of the people only learn about it if the media do a "silly season" type coverage. This blog is so interesting and well written! I learn something new every time i visit! This is interesting. I have always known rats to be intelligent creatures and this has only solidified that belief.